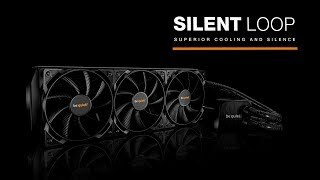 SILENT LOOP 280mm silent premium Water coolers from be quiet! Silent Loop 280mm brings the famous be quiet! whisper-silent technology to the world of all-in-one water cooling. No compromise is required when choosing to water-cool demanding systems and heavily overclocked CPUs. This innovative, decoupled pump assures excellent cooling efficiency and whisper-quiet operation. The pump’s “reverse-flow” technique draws the liquid coolant from an outer cavity of the pump housing across the base plate, discharging the warmed coolant through a second level inside. This is key to guaranteeing the silent be quiet! operation. The two high-quality be quiet! Pure Wings 2 140mm PWM fans combine outstanding reliability and silent cooling. Their silence-optimized fan blades reduce noise-generating turbulences while simultaneously increasing air pressure. This makes the fans the perfect partner for be quiet! Silent Loops high-performance full copper radiator. Flexible tubes that are bend- and pinch-protected take the worry out of routing the supply lines. The refill port and tubes help extend the product’s life span and make handling easier. The compact and well thought out design of the heat exchanger enables full use of available RAM slots and is compatible to all current CPU sockets. Convenient radiator mounting is compatible with most case designs.